It was in week one, at the September 11 game against the New York Jets, that things first started to make their downward spiral for the Dallas Cowboys. Things were going very well for the Cowboys at first. In fact, they were actually up by fourteen points…until the fourth quarter meltdown. They lost the game when Jets player Nick Folk managed to kick a 50 yard field goal with only a few seconds left on the clock, thereby overpowering the Cowboys by three points and taking home the victory. 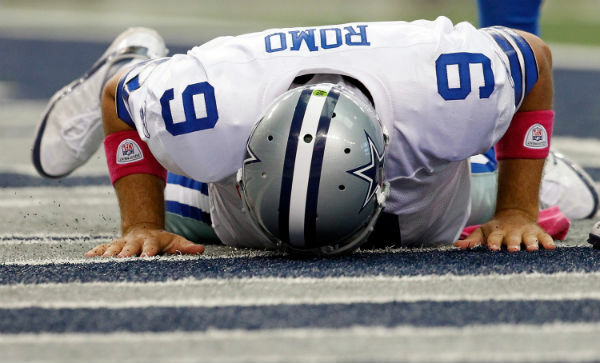 Fans were shocked and devastated at this rocky start to the Dallas Cowboys 2011 season. One horrible game would have been bad enough, but things just kept getting worse. In week four, a similar loss in the 4th quarter against the Detroit Lions occurred, causing the team to lose 30-34. This repeated in week six, when the team once again faltered in the last quarter, this time against The New England Patriots, losing 16-20. The only break in this awful pattern came when the team was completely stomped on, for an entire game rather than just the fourth quarter, by the Philadelphia Eagles in week 8. That score was a humiliating 7-34. Game play resumed its “normal” course in week thirteen, when the team fumbled in the fourth quarter and ultimately lost to the Arizona Cardinals, and the following week when it lost a huge game to the New York Giants. The last gasp of hope to salvaging a disastrous season came in a winner take all re-match against the New York Giants. Unfortunately, however, the Cowboys couldn’t even muster up the gusto to make it a contest and went home big losers. The Cowboy’s may have lost more than they bargained on this year, they may have lost the title of “America’s Team”.